Ever since I started performing abdominoplasties with a liposuction technique, it has been evident that, quite often, cutaneous excess had to be resected as an associated procedure. Thus, the roots of the origin of new concepts in abdominoplasty arose a long time ago. Nevertheless, high rates of local disorders after combined operations (seroma formation, hematoma, sloughing of the skin, panniculus necrosis), as well as systemic complications, used to occur with all plastic surgeons. I became so disappointed with all these complications that, in 1988, I made the radical decision of not performing such combined operations anymore. However, during 10 years of anatomical studies, and by analyzing peri- and postoperative complications, I concluded that most of these problems were caused by panniculus undermining when perforator vessels coming from the rectus abdominalis were sectioned, causing interruption of the arterial blood supply and venous and lymphatic stasis. Over a long period of time, I performed anatomical dissections on cadavers with the purpose of finding an answer to the problems mentioned above. I started to perform full-thickness liposuction of the subcutaneous tissue in an elliptical area on the suprapubic region, followed by skin resection, and found that the perforator vessels were preserved. Therefore, in 1998, I was sure that such an operation could be performed safely, without any bleeding during or after surgery. Meanwhile it was clear that a new procedure could be performed to suction the accumulated fat, combined with skin resection to remove the redundant cutaneous covering after fat suction, with minimal complications. 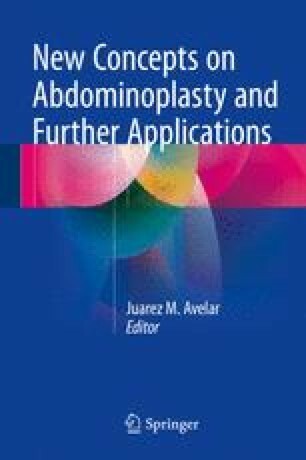 The new approach was published and presented in 1999, detailing the original anatomical studies that are the basic fundamentals of the new concepts in abdominoplasty associated with liposuction; that is, lipoabdominoplasty. My descriptions in publications and presentations at congresses, symposiums, and courses were very clear, so that other surgeons were able to learn, employ, and confirm the basic principles concerning the new concepts in abdominoplasty, and thus other plastic surgeons were convinced to perform lipoabdominoplasty. These surgical principles are essential for the lipoabdominoplasty procedure to improve body contouring; as well, these principles are essential in several other regions, according to my original descriptions for flankplasty, torsoplasty, medial thigh lifting, and esthetic surgery of the axillary regions. The principles may even be employed to perform face lifting, ear reconstruction, reverse lower blepharoplasty, and procedures in other segments of the human body. Such a combined approach, with its suitable physiological surgical principles, is very important in plastic surgery, so that the vascular nervous pedicles, in which are contained arteries, veins, lymphatics, and nerves, are not cut. When these structures are properly preserved in lipoabdominoplasty, smooth and esthetic results are provided, with good sensibility in the remnant abdominal panniculus.